Instapaper is a cool new service taking bookmarks back to basics. If you come across some websites that you want to read but are too busy to do so, you can click on an Instapaper browser bookmarklet and then return to the Instapaper website later to read them. Think of it as Del.icio.us stripped of any tagging or social features. You come across substantial news or blog articles that you want to read, but don’t have time at the moment. You need something to read while sitting on a bus, waiting in a line, or bored in front of a computer. Instapaper has a very simple design; you don’t even need a password or email address to use it. 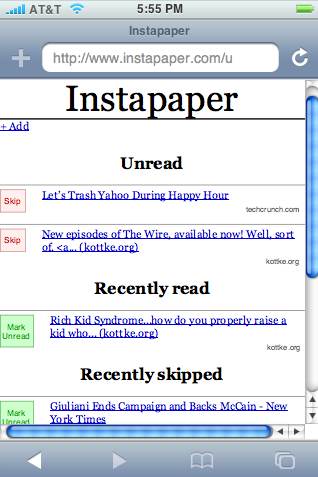 When logged into Instapaper, your links are sorted into three groups: Unread, Recently Read, and Recently Skipped. Buttons on the side help you sort links between the groups. Clicking one of the ‘Unread’ links automatically pushes a site down into the ‘Recently Read’ feature. Instapaper also plays nice with the iPhone, featuring an optimized interface and the now-obligatory customized web clip. We’ve covered two other similar bookmarking services recently: WebMynd and ControlC.